We're sure that anyone using the Internet (yes, you right there) is well aware of the various SOPA blackouts that have taken over your favorite websites, such as Google, Craigslist, and several other major online companies. Even Wikipedia has taken a stance on this infamous piece of legislation, blacking out their entire English-language site in order to educate viewers. But if you're on the other side of the fence and support SOPA (or just appreciate ironic humor), then you can start censoring people in the real world as early as next month. 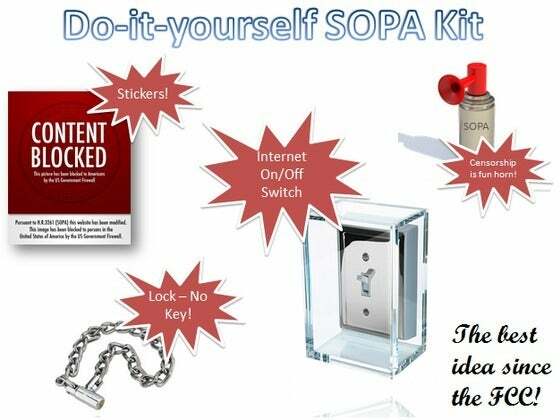 Eric Calisto's recently-launched "Do-it-yourself SOPA Kit" includes a lot of items that you can use to both educate people about the "Stop Online Piracy Act" and just outright annoy random strangers. Claiming to be "the best idea since the FCC" is a bold stretch, but then again, the FCC can't go right up to your doors and start locking things up without a key. $100 -- Everything above, with a "SOPA surprise"
If you want to learn more about SOPA and PIPA, you can get a full breakdown in Jared Newman's overview. After all, you're not going to find anything on Wikipedia but your political representative's contact information. And once you've copied that information down, there's always an alternative if you really need an online encyclopedia for the day.